In your company, users store their files on a shared volume called \\Shared. The \\Shared\Data folder is broken down into folders for each department. Each department folder is broken down into folders for users from that department as well as one or more folders that are shared by all users in that department. The \\Shared\Data folder also has one folder — \\Shared\Data\Common — that is used to share information between departments. This generates a list of usage in megabytes of the top-level folders contained in the \\Shared\Data folder. The output is sent to the Deptdata.txt file on your C drive. You can see in this output that only the Admin, ConsultServ, CorpServ, Design, Engrg, Finance, ProdMktg, Research, and Training departments have more than 50 MB of data each. This generates a list of the all top-level folders contained in any of the listed folders that use more than 50 MB of disk space. The output is sent to the Userdata.txt file on your C drive. You can see in this output that only one user, Jack, is marked as using more than 50 MB of data. 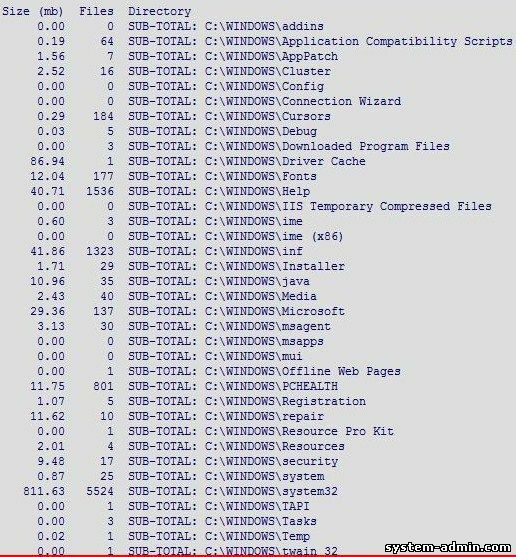 When you compare the output, you see that the only folder that contains compressed files is C:\Windows\System32. The /s parameter specifies that you want information about all subdirectories on drive X. The redirect symbol (>) redirects the output to a file called Drvdata.txt. After DirUse writes the directory information to the text file, the batch file switches back to drive C and starts Microsoft Excel. The command-line argument of the file name causes Microsoft Excel to open Drvdata.txt when the application starts. If you plan to use the batch file frequently, you can create a Microsoft Excel macro to sort, delete, or format the data.